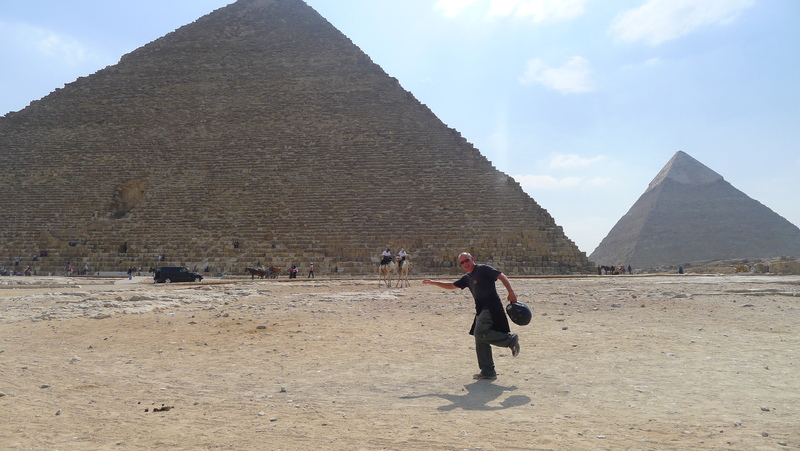 As we were now stuck in Egypt we thought we should make the most of it and see the country and take in its amazing culture and history. 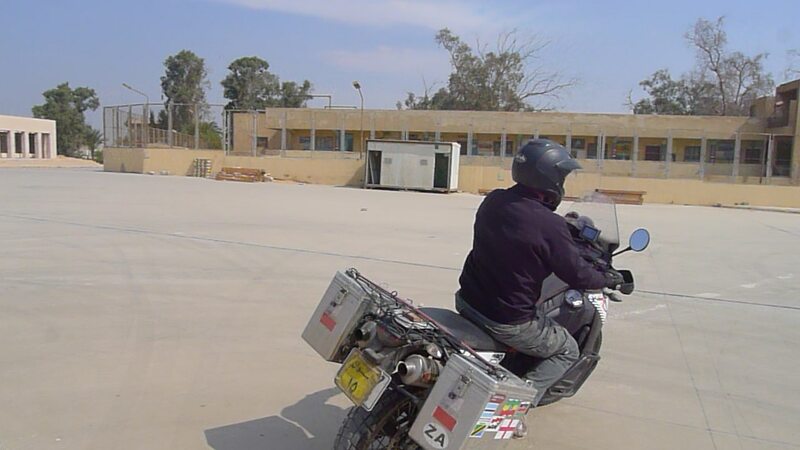 To do that we were going to have to extend our visas and also the permits for our South African registered KTM motorcycles, and that meant we needed to go to the capital, Cairo. 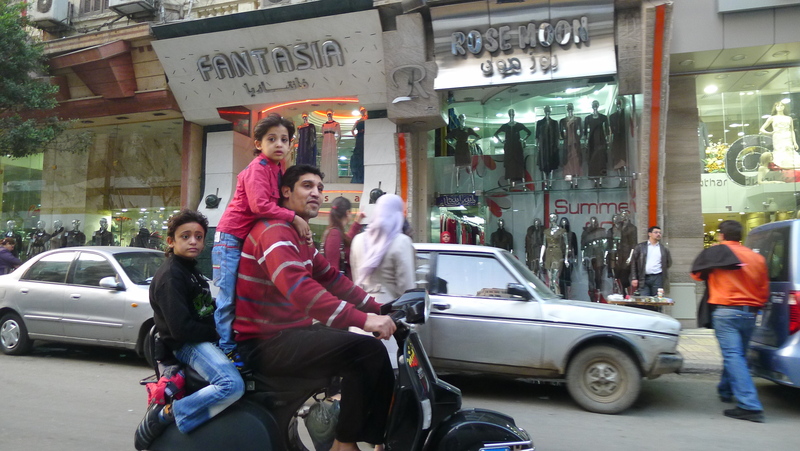 Riding a motorcycle into Cairo isn’t for the faint hearted. 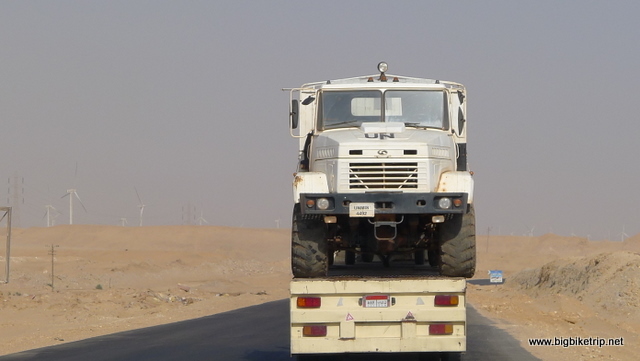 As we exited the Suez canal tunnel and found our way onto the correct highway into Cairo the peace of the desert finished and road madness began and got steadily worse until we were grid locked in the heart of a city with perhaps the worst driving on the planet. All the signs were in Arabic and despite memorizing the hieroglyphs for a few words like Cairo, Suez, Alexandria, Port Said, entrance, exit, etc… I was still having some problems making sure we were heading in the right direction. For a reason I was only to discover much later in our expedition, the GPS was showing the most basic of details in north Africa and was for the large part no more than a compass with a few out of date roads. In fact the Garmin Zumo GPS became more and more erratic and dangerous, to the extent that sending one up the wrong way of a Cairo street is pretty damned dangerous. Again, we would get honked at, shouted at, waved at, and people would start animated and persistent conversations with us out of the windows of their vehicles that we could not hear in our helmets. 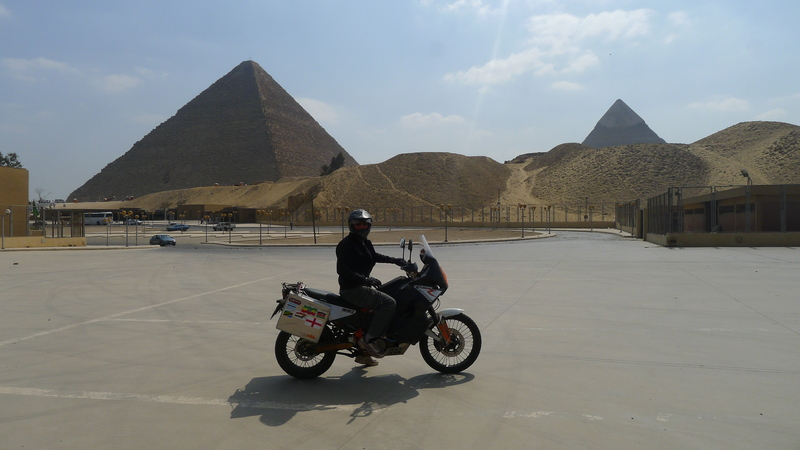 Egyptian drivers might not think its important to look where they are going but my experience of motorcycling is that its a very good idea. 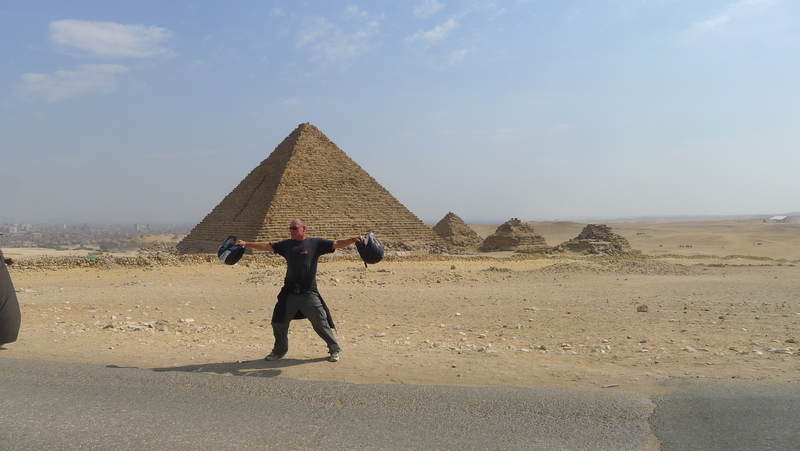 The millimeter collision avoidance style of driving could almost be described as skillful, but it would scare the hell out of me and so when we did arrive in Cairo we both decided to leave the bikes at the hotel and walk for most of the time. Occasionally we took a taxi which is an experience most people should also consider leaving off their “things to do before I die” bucket list, unless of course its the very last item on such a list. We decided to head to the Zamalek area, an island in the Nile in the center of the city, where we heard there was a decent backpackers hostel called the Mayfair (http://www.mayfaircairo.com/). 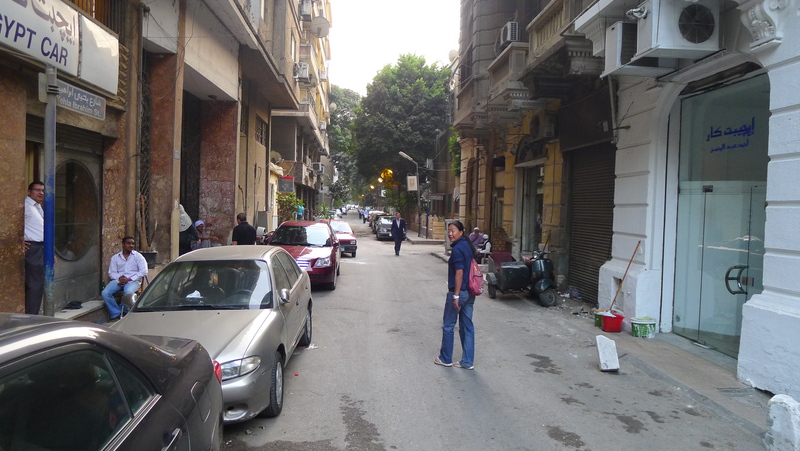 After riding along every single street in Zamalek, twice, sometimes three times, we found the hostel four hours later and then I had a pointless argument with their management and security guard about where to park our motorcycles. In the end I relented and moved our bikes all of three meters right into the middle of the footpath to where they said we should park them. Why? I never found out, there was no given or obviously logical explanation for placing the bikes in the center of the footpath causing what looked like an obstruction. However, the night guard of the hotel, at least a hundred years old, parked his chair under a tree right next to the motorcycles and waved his stick at anyone who dared to look at them. 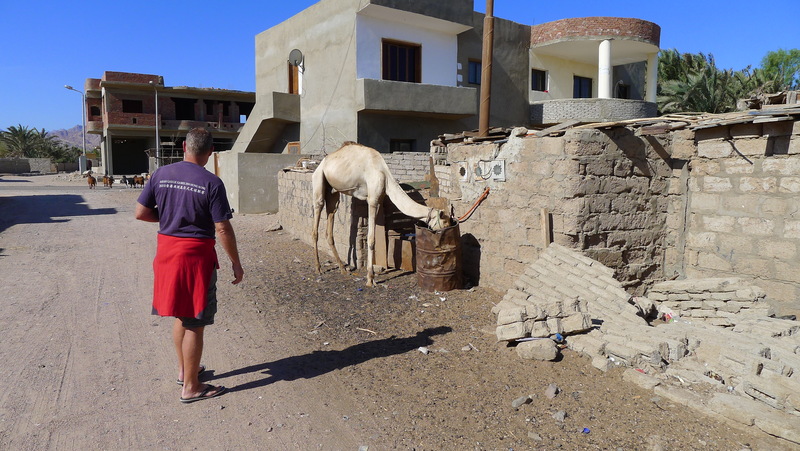 We got to know many of the local people and soon after everyone in the immediate vicinity of the hotel got to know the bikers who had ridden up from South Africa and greeted us warmly whenever we walked up and down the street. The motorcycles stayed in the center of the pavement unharmed for five days among huge crowds of pedestrians and protesters, not 50 meters from the Libyan embassy where celebrations started the day we arrived as Kadaffi had just been captured and summarily executed. The crowds were quite big and the noise they made was loud and unrelenting. 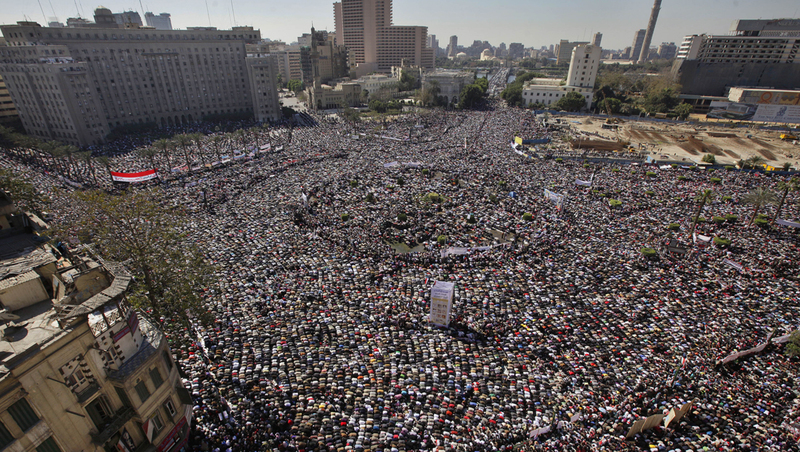 We were after all right in the middle of the Egyptian “Spring” Revolution. History was being made right around us. 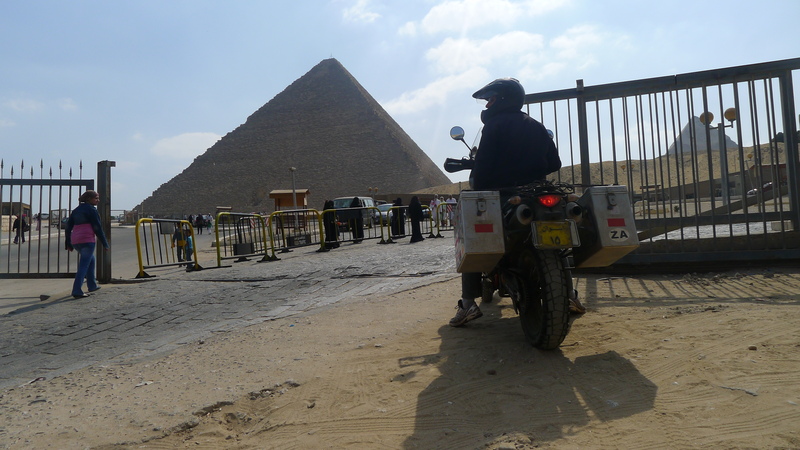 Me and my bike at the pyramids in Giza, Cairo. The natural and the unnatural. Tahrir Square with the government building we have to get our visas from at the top left hand side of the photo. 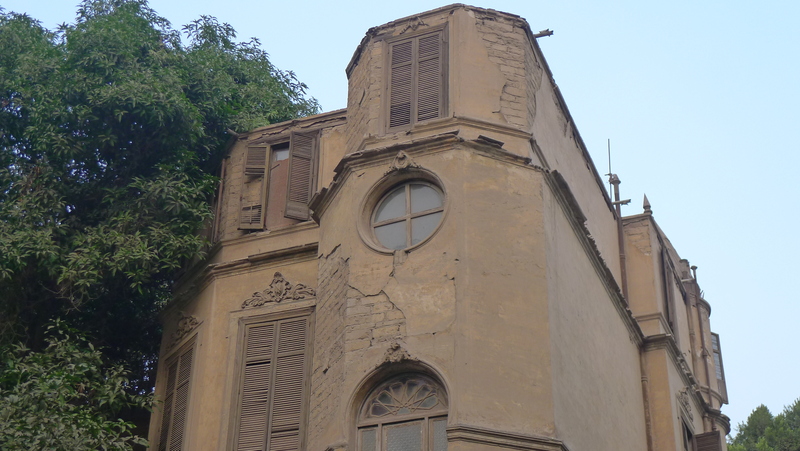 Zamalek and Old Cairo reminded both Fanny and I of Shanghai–a lot. Splendid British colonial architecture that had either been restored by the new elite into hotels, clubs and apartments, or more often than not, allowed to decay and left to deteriorate. 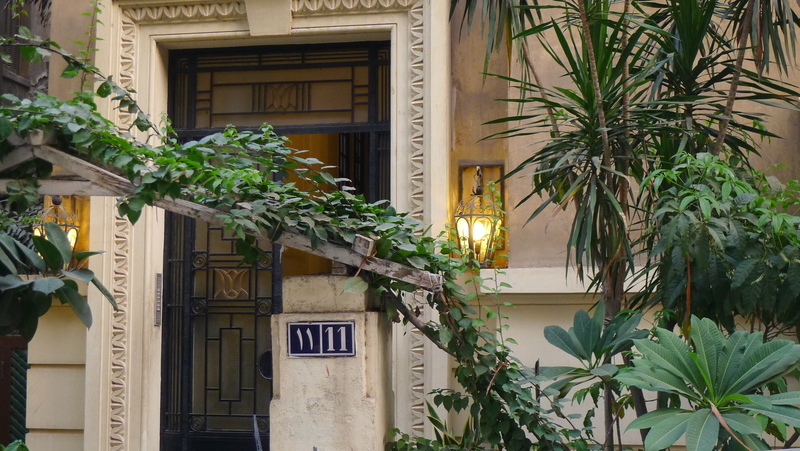 By far the nicest places were the embassies and consular homes in the diplomatic quarter. Many of the building had classic Art Deco style lobbies staircases, windows and verandas, including the Mayfair hostel we lived in. Many of these large houses had beautiful gardens right in the middle of prime real estate. All very impressive, but many had seen much better days. Perhaps the most ostentatious and vulgar symbol of the huge gap between the “haves” and “have nots” was a golf course right in the middle of Zamalek. At first I assumed it was a public park, but as we tried to go in we were herded away by dozens of white clad security guards. Later, I peered through the fence into a huge expanse of privately manicured grass that had a total of two people wandering around wearing ridiculous golfing clothes and pulling along their golf bats in shopping trolley things. Perhaps in this post Mubarek era it will be turned into a public park that more people can enjoy? It seemed there were many places that were private in Zamalek and off limits to riff raff like us. 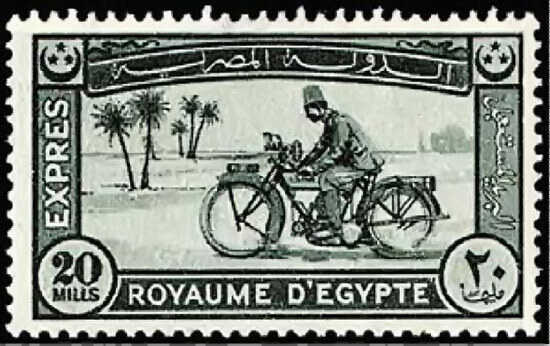 The main reason to be in Cairo was not to allow Fanny to eat at every street-side store, although she tried, but to keep up efforts to get to Europe and extend our visas and motorcycle permits. 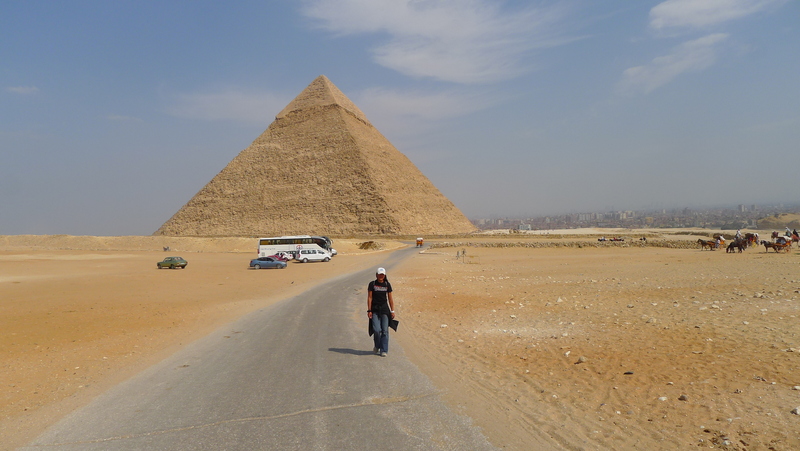 We also wanted to see the pyramids and the Egyptian museum, both very much highlights of our trip to Cairo. The pyramids in Giza really are on the edge of the city and its quite an astonishing surprise to see them looming up above the buildings and houses of Cairo as you approach them from the city center about 10 kilometers away. Some people literally have them as their next door neighbours. 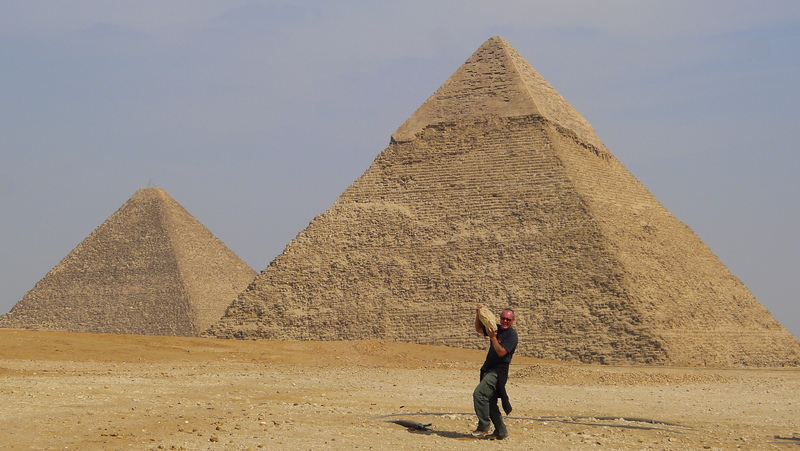 As we approached the pyramids on my motorcycle I had to be careful not to stare at them too long and get distracted from the important task at hand of proactive impact avoidance. When we arrived there were some security people manning various gates and so I parked up my bike next to the security gate and Fanny and I went in and wandered around. 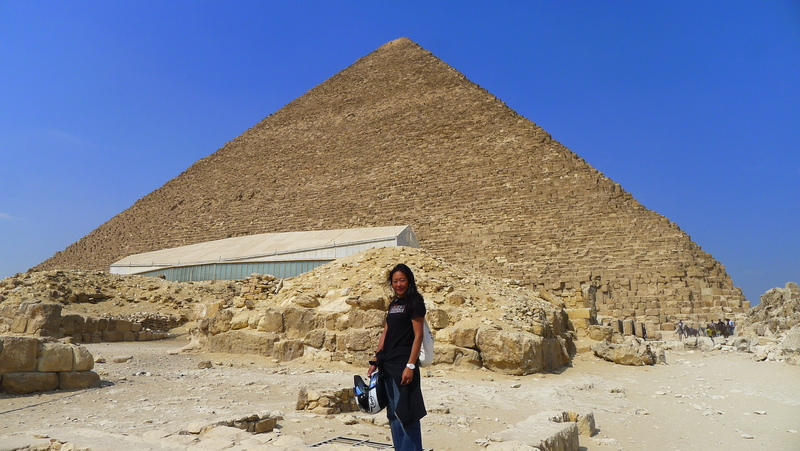 The pyramids are quite the most amazing human constructions I have ever seen. Firstly, they are absolutely huge, the largest being made up of 2.3 million limestone blocks and nearly 500 feet high, and secondly they are some of the only structures that have survived over four thousands years of modern human history. You are mesmerized just looking up at them. 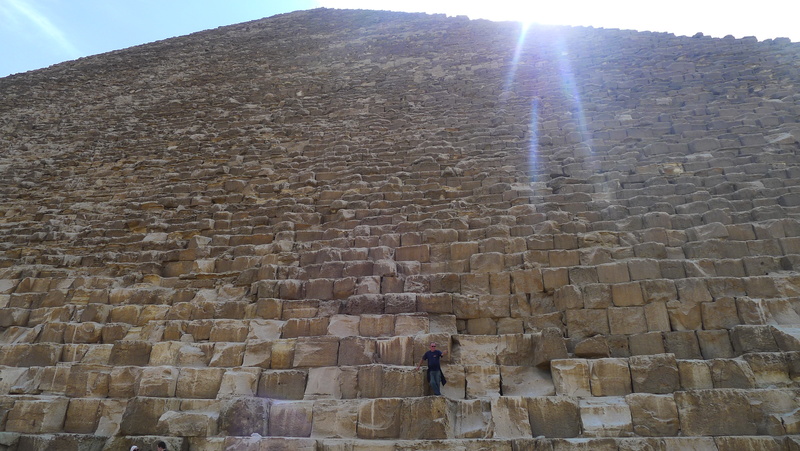 Also, like much of ancient Egyptian antiquity they are extremely accessible and I was surprised that we were allowed to climb and scramble over them. 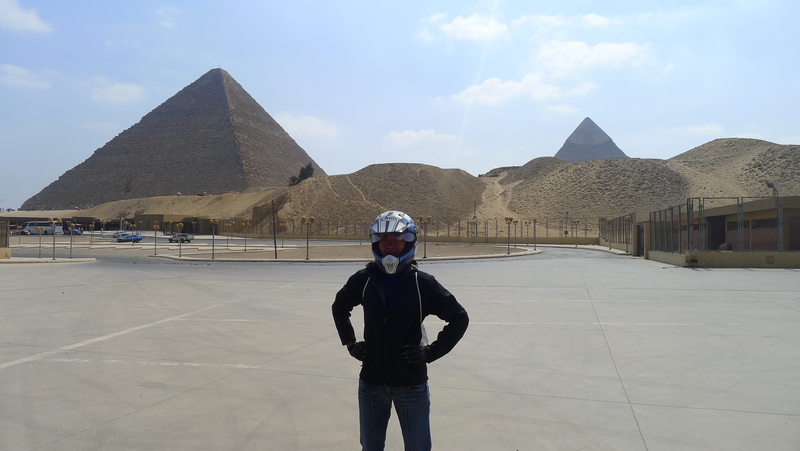 Unlike more famous motorcycle adventurers who have visited the pyramids we did not go inside them. There was a fee for doing so for a start and both Fanny and I suffer from claustrophobia. I was of course interested to know what was inside these gargantuan tombs, but not so much that I would ever venture inside and so we spent the morning hiking around the two huge pyramids, one medium sized one and three small ones. 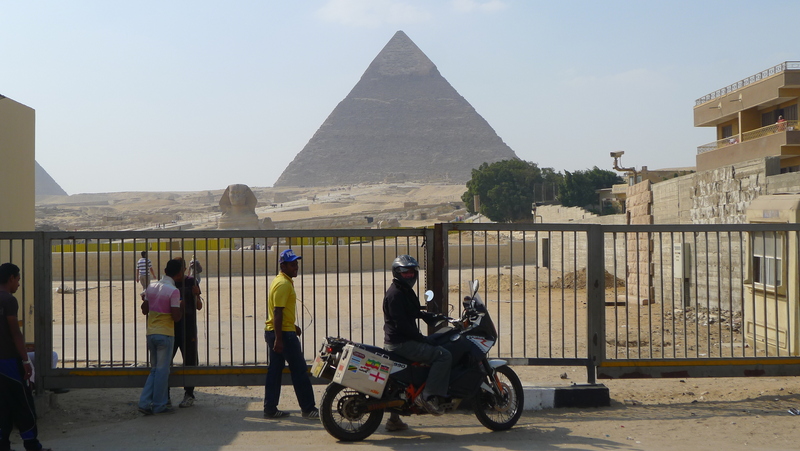 We could also see the Sphinx from a distance but it was much closer to the built up part of Giza and so we decided we would go back to our motorcycle and ride over to it for a better look. I was surprised to see that the Sphinx was not only much smaller than I expected, but also very badly eroded and it seemed to be crumbling away. Our attempts to ride up to it on my bike were thwarted by being stopped and detained briefly by the police. We were actually very close to being arrested but managed to talk our way out as a crowd of increasingly agitated officials started to gather around us. All of a sudden I caught a glimpse of a very angry and obese senior police officer waddling towards us waving his fist, shouting and swearing and so we decided that was our cue to escape. I slide the bike around 180 degrees on the soft sand to a roar of Akropovik exhausts causing the crowd to rear backwards and in a cloud of dust powered our way back through the gates with Fanny hanging on for dear life. It was a close shave as it would have been an excuse for the authorities to confiscate our motorcycles and no doubt squeeze some cash out of us. Thank heaven for donuts. “Just gone out for a ride on the bikes… Table Mountain, The Great Migration of the Serengeti and Masai Mara, exotic Zanzibar, the “Big Five” animals, Mount Kilimanjaro, Mount Kenya, Mont Blanc, Mount Everest, the largest sand dunes in world in Sossusvlei, the Okavango Delta, remote African tribes in the Rift Valley, the cradle of civilization, the great lakes of Africa, Great Wall of China, Rock hewn churches in Lalibela, Mount Sinai and Moses, The Red Sea, The Nile, the Sahara, Nubian, Kalahari, Namib and Gobi deserts, the Tibet-Qinghai Plateau, the Himalayas, lived with Tibetan lamas, saw the source of the Yangtse and Yellow Rivers, ruins of Pompei, the Colosseum, Stonehenge, the Arab Spring uprisings, …. and .. oh yes the Great Pyramids at Giza. Come on, English slave … there’s one missing at the very top. Fanny wondering what sort of tourist site this is without any food stalls. Must have been at least half an hour since she ate something. 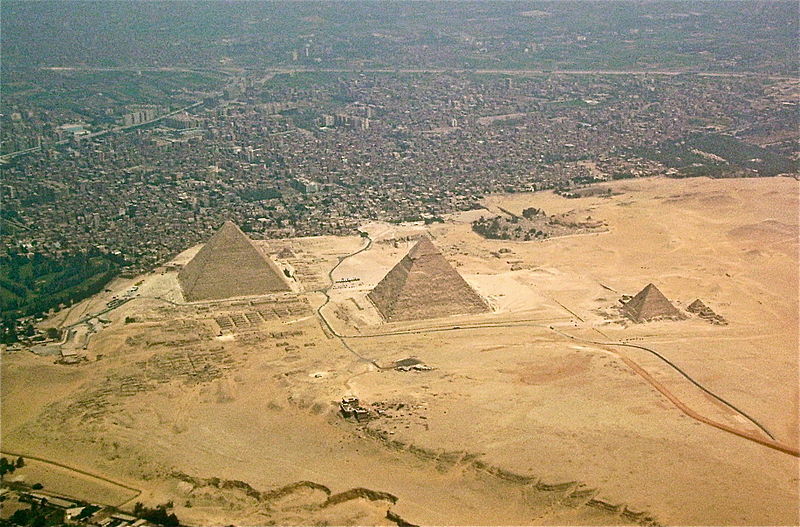 An aerial picture of the pyramids showing how close they actually are to the urban area. The Sphinx .. much smaller and much more eroded than I expected. 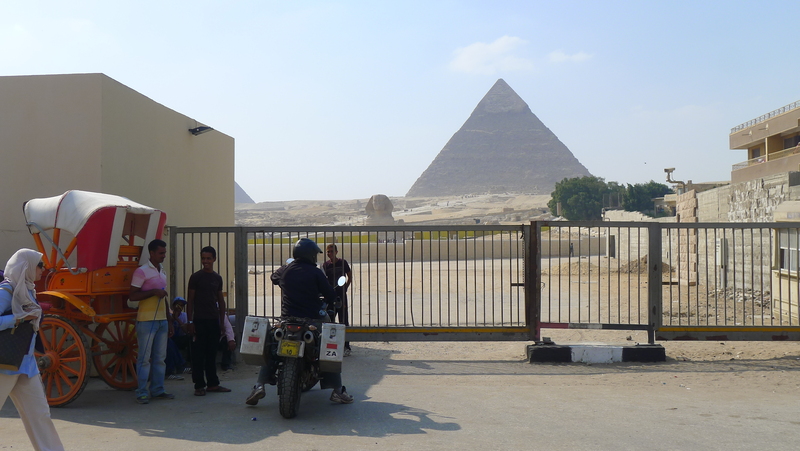 Having been thrown out of the Sphinx enclosure by the police I find another place to try and take a picture. Can I stop here and take a picture? No? OK I’ll move on then. Extended visas .. good for another month or so. Now we have to go to the airport to get customs to extend the motorcycle import permits and endorse the carne de passage and we are done. 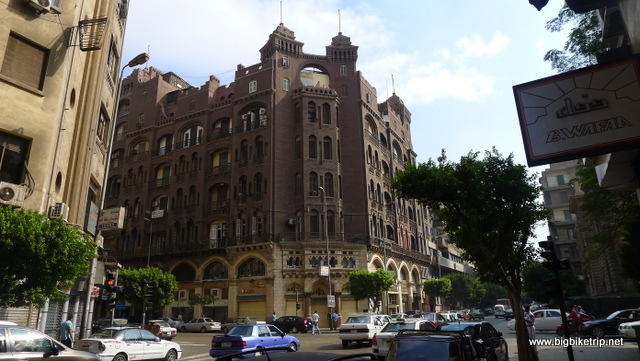 I actually think Cairo has some wonderful architecture .. not just the pyramids Looks very much like the British and French Concession areas in Shanghai in places… I guess due to the British colonial influence. 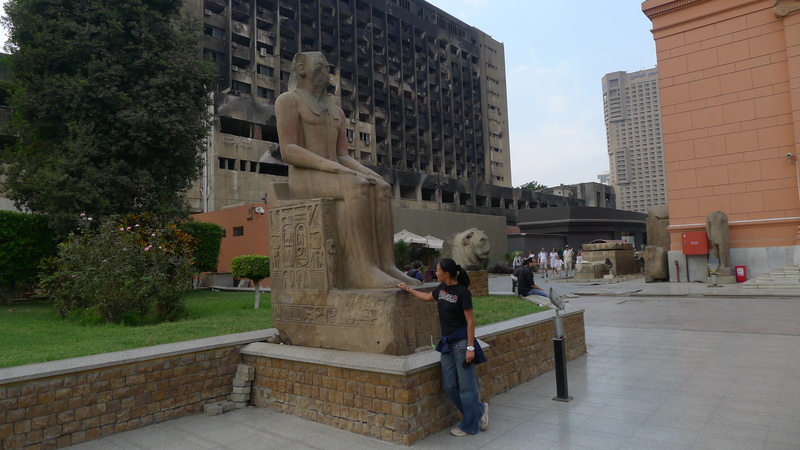 Fanny outside the Egyptian museum with a burnt out building from the riots in the background. Inside the Egyptian Museum.. quite possibly one of the best I have been to. Later we also went to the British Museum in London which was also excellent. 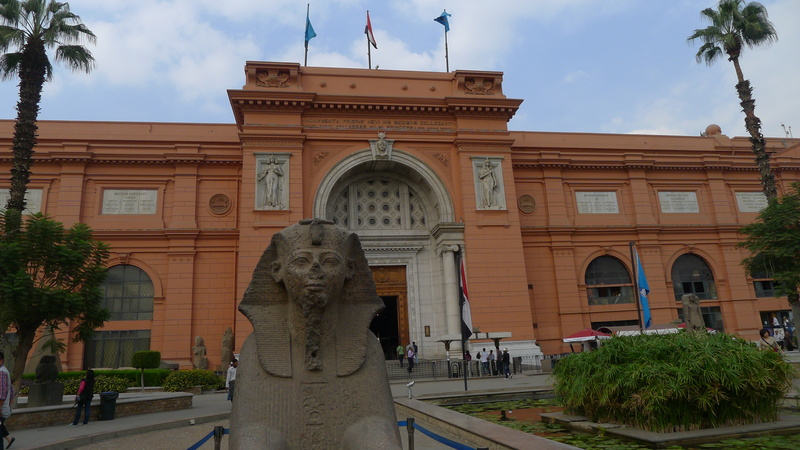 However, the joy of the Egyptian museum is everything is very accessible. You can get right up and touch the exhibits. 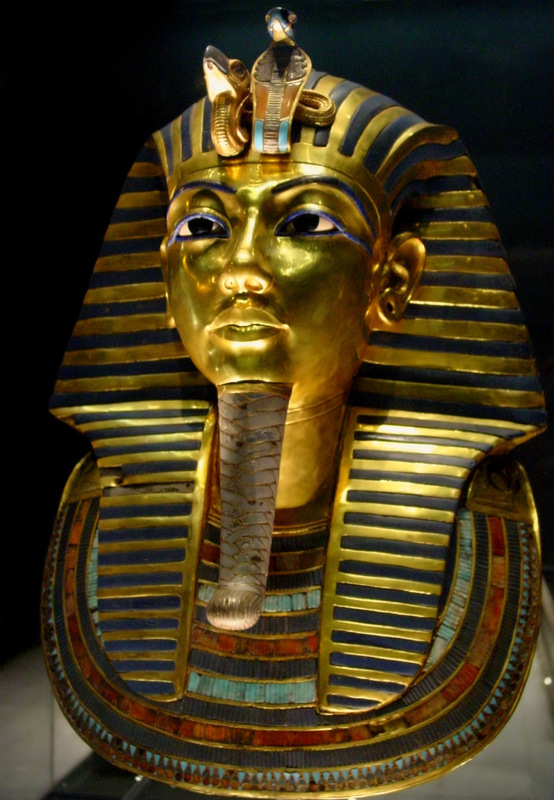 The magnificent Tutankhamen mask. I have actually seen it before when it was exhibited in London many years ago. But on that occasion it was a long way away and surrounded by guards, fences and huge crowds. Here in its home in Cairo you can get very close and inspect the workmanship and see how it was made. Interesting architecture, but sadly some of it falling into disrepair like this one. 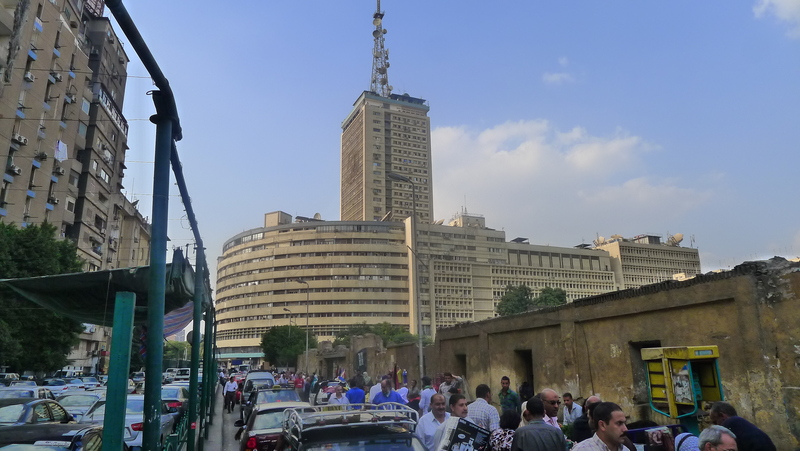 To get our visas extended we had to go to the huge and chaotic immigration building in Tahrir Square right in the middle of the city. We had been told by many people not to walk there, and in particular to avoid going passed the central television station building, and so we ignored them all and that is exactly where we went. For the police and army, I supposed, any distraction from their boring duties was welcome and they engaged in light hearted banter with Fanny and myself as we walked by. Fanny was as usual eating local street food and they were asking if she liked it and were delighted when she gave an enthusiastic thumbs up. I was looking at the riot police and reminiscing back to the days when I was in a similar position. As a young policeman in London in the early 1980s my colleagues and I had to deal with violent riots in Tottenham, Southall, Brixton and Wapping. Later as a police tactical unit commander in Hong Kong I led my platoon during the taxi riots in Mong Kok and Yaumatei. The Broadwater Farm riots in Tottenham, north London I remember very vividly as they were extremely violent and destructive and one of my colleagues from another district, called PC Keith Blakelock, was hacked to death by murderous thugs as he was protecting the fire brigade . People forget that the police are human themselves and just doing their job, usually a thankless and sometimes dangerous one. But things were not always violent. During the Miner’s Strike in the UK during the early 1980s Metropolitan Police officers like myself were sent to the mining communities “oop north” to assist the local constabularies with public order duties. For my part I spent most of my time asleep or standing around a coal brazier at a picket line outside a colliery together with decent down to earth miners who were striking to protect their livelihoods. We were thrown together by circumstance and most of the time chatted amicably about sport, politics and the usual subjects men talk about. Now in Cairo in the middle of the Egyptian revolution Fanny and I were walking between the ranks of the police and the protesters in Tahrir Square. Like my experience on the “Miners Strike” nothing particular was happening and so the press and media had nothing to report. I wanted to take some pictures, but security aside I didn’t think it was the right thing to do, and so we waved and smiled to both sides and they waved cheerily back at us. 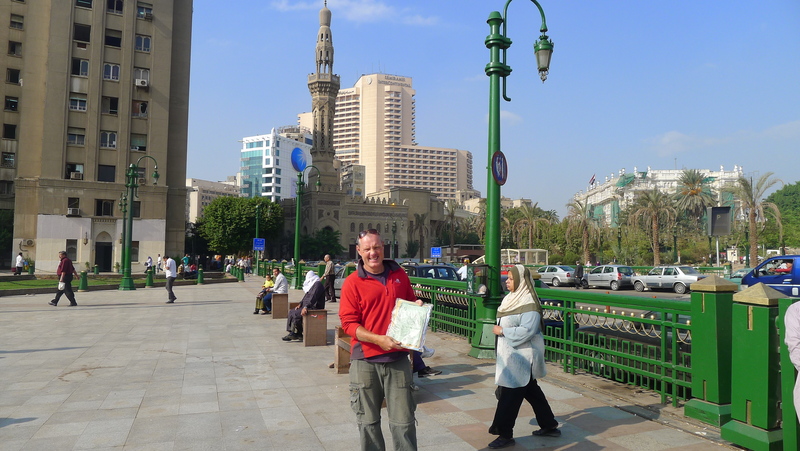 Everyone was friendly and some Egyptians came up to us, welcomed us effusively and thanked us for visiting Cairo. 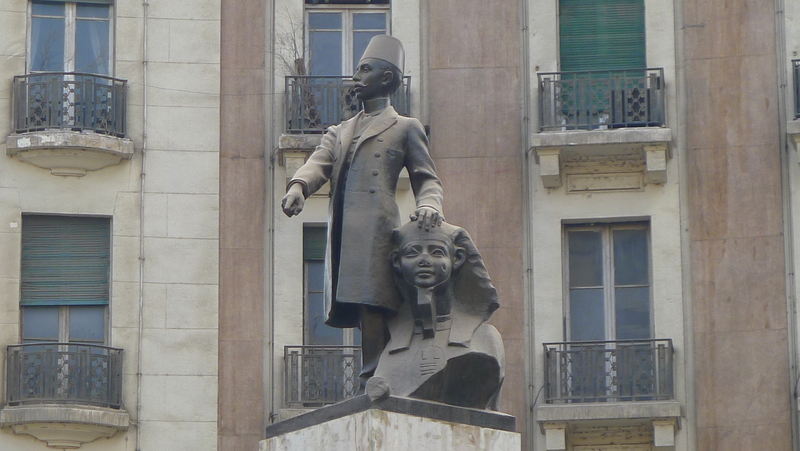 After we had got our visas extended, quite quickly I might add, at the huge passport and immigration center we decided to explore the rest of the area and visit the famous Egyptian Museum which, like the government offices, was right next to Tahrir Square. Before going into the museum all visitors were subjected to body and bag searches. I had forgotten that inside Fanny’s bag was our arsenal of self defence kit and was not sure what to do with it all. We could hardly hide it, throw it all away or hand it in and so we nonchalantly walked through the x-ray and scanner machines with a bag containing pepper spray, a 1.5 million volt zapper and my trusty catapult. I felt a pang of “Midnight Express” panic when the buzzer went off and our bags were searched. The security officer rummaged through Fanny’s bag and took out our camera and placed it in a locker for safe keeping as photography inside the museum was forbidden. The rest of the booty, including our camera phones (?) were left inside and we were allowed to proceed. I made a mental note to dispose of our arsenal before we entered Europe. As lax as the UK Border Agency appears to be I did not want to take any chances. We thoroughly recommend the museum. 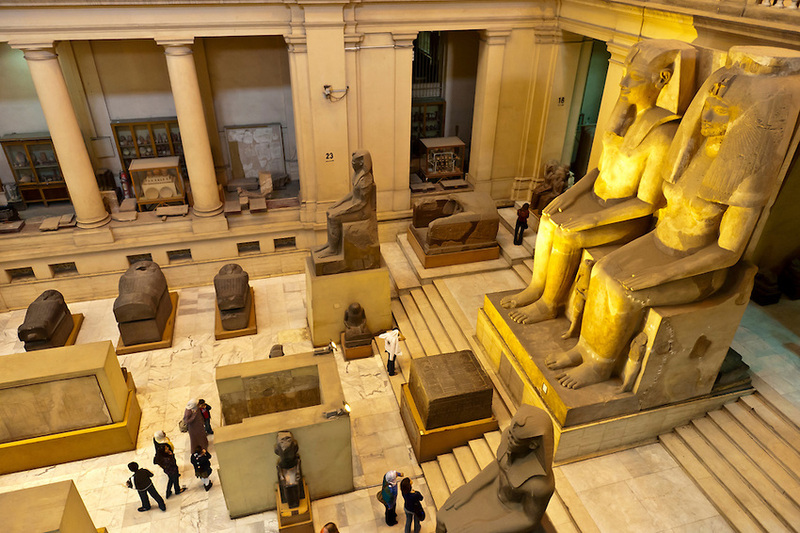 Simply an amazing and very accessible collection of some of the worlds greatest treasures, including the famous Tutankhamen gold and a huge collection of ancient statues, paintings and Royal Mummys. Now that we had our visa extensions we needed to extend the permits for the bikes which were stamped only to the end of October. 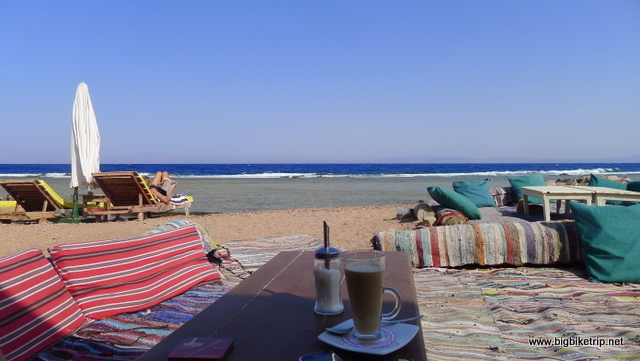 After a few inquiries I found out this would have to be done at Cairo airport so we decided we would leave Cairo and go back to the Red Sea, via the airport and perhaps rent an apartment for a few months in Dahab. 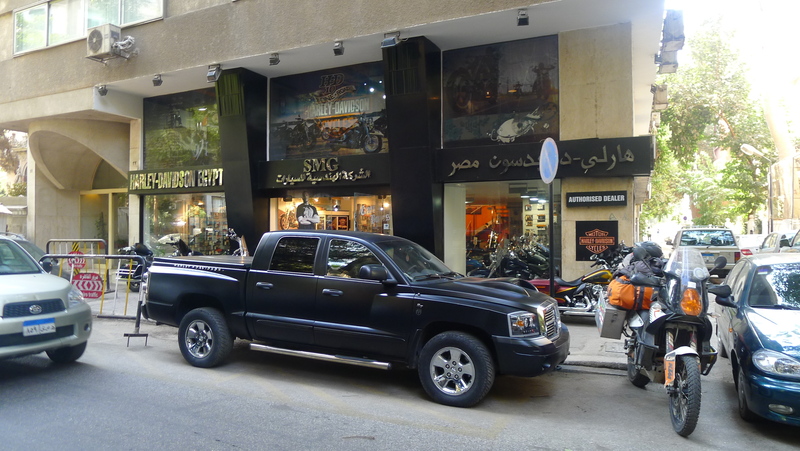 We checked out of our hotel, loaded up our motorcycles and again got lost and spent a couple of hours trying to escape from the center of Cairo. 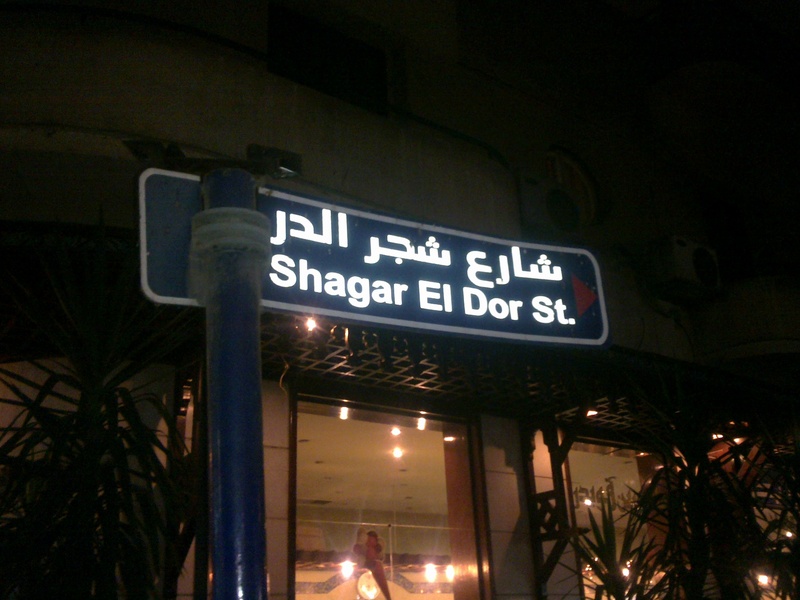 The GPS was still playing up and had no idea about one way streets, of which Cairo has many, and so we went round and around in circles until by chance we found a sign with a picture of a aeroplane and followed it to Cairo International airport. We found the car customs department at the airport fairly easily, once of course we had managed to navigate through some shocking traffic jams. As we were parking our bikes outside the car customs offices a man came up to us and explained he was a customs agent and could help us if we had the correct documentation. We did, and after negotiations we settled on a very modest fee and he set about his work while Fanny and I waited with the customs officials and shared cigarettes, cigars and soft drinks and joked about…. Fanny being her usual loud self, laughing, guffawing, and generally amusing everyone. 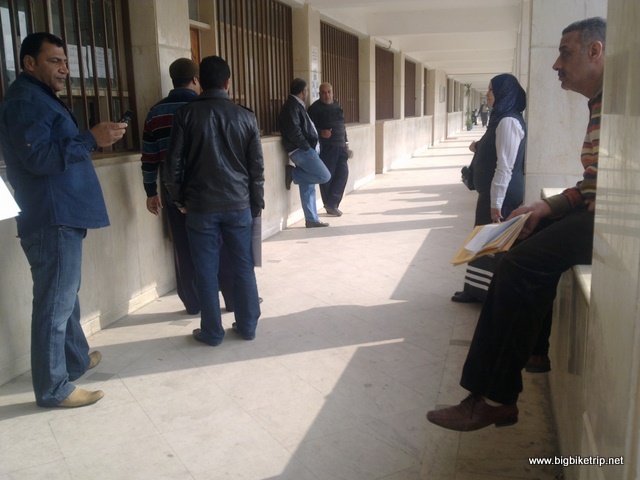 Waiting around at the customs offices at Cairo Airport for our motorcycle documents to be processed. No idea what it says but it looks official and allegedly allows our carne de passage to be extended. Phew. The impounded vehicle park full of cars covered in dust. There were Bentleys, BMWS. Mercedes and also one or two motorcycles. 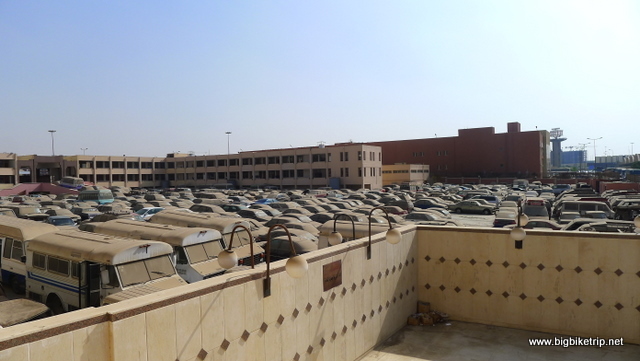 Each vehicle having a history of misery for the owners who did not complete the correct import procedures for Egypt. Each would later be sold at a ‘closed’ auction. Whilst looking down upon a huge car park of dust covered impounded vehicles, that included a disproportionately large number of German and South African registered luxury cars, I found out how “the big customs scam” operated and worked. I have been in the business of investigation and intelligence for many years, often leading teams on complex financial enquiries and so I guess I am quite good at interviewing and finding things out. A little immodest granted, but with my weaknesses, of which I have many, I know my strengths, and at my best I’m pretty good at getting people to tell me things. Why tell someone something anyway? Well, everyone likes talking and everyone weighs up the net gain advantages of engaging in any activity against the risks of doing so. My Arabs customs friends realized we had the correct papers and that our engine numbers and documents matched to the digit, found us reasonably amusing and non threatening, and had made a few bucks through their fixer and our fee ….and importantly they were bored and were showing off to a fellow member of the cloth how they made substantial profits at the expense of dumb foreigners. 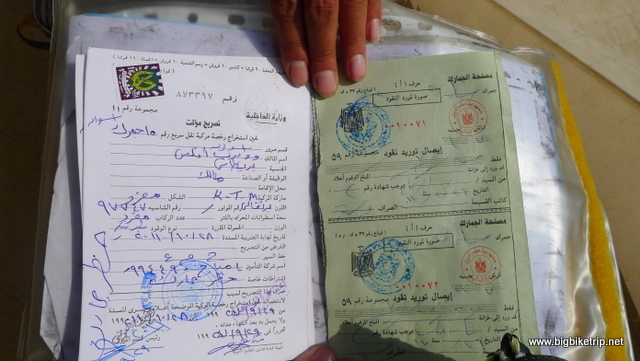 Anyway… we got the carnets, import receipts and other documentation, bade farewell to our amusing hosts at Cairo airport customs and headed back along the highway to the Suez canal tunnel. 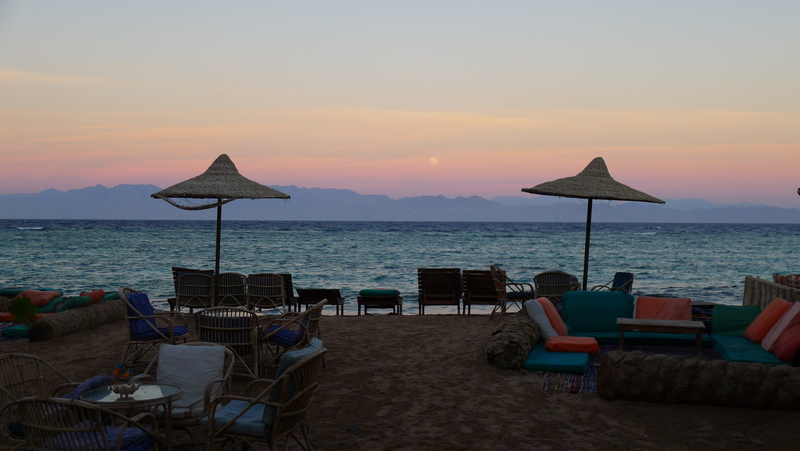 I cannot tell you how happy I was to be seeing the back of a very congested and hectic city and heading back into the desert and towards our target destination of Dahab by the Red Sea… a none too shabby place to mark time while we considered and researched our options. After going through the tunnel yet again and waving at all the soldiers we got to a major junction in the road. 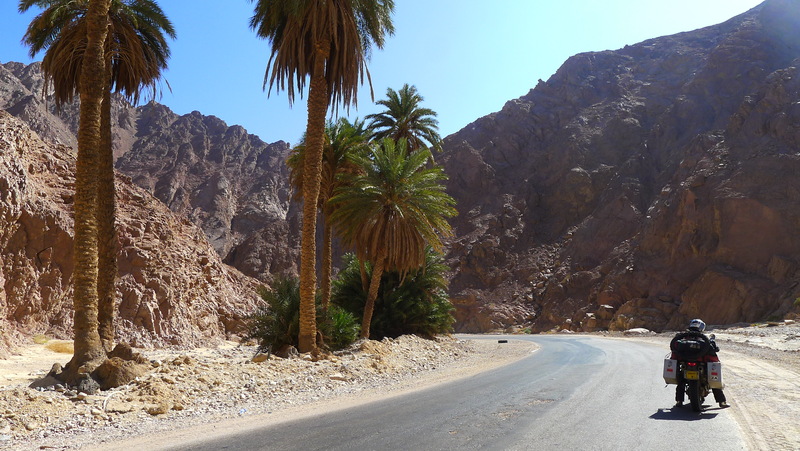 The left fork took us across the Sinai through Bedouin bandit desert lands, and the road ahead took us back down the 400 kilometer road to Sharm El Sheikh. 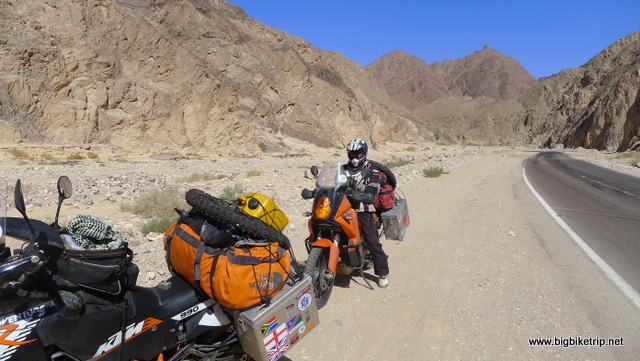 My lying gypsy Garmin GPS showed that the route across the Sinai desert was off road and so I stopped and asked Fanbelt which way she’d like to go. ‘Is there sand?’, she asked. I looked left and the top bit was azure blue and the bottom bit from horizon to horizon was white. ‘Might be a bit’, I answered honestly. I think it was the prospect of staying in “The Shining” hotel again that swayed Fanny to choose the desert route and so we blasted off eastwards knowing we would not get across by night fall and so I would have to keep a good look out for a place to bush camp off the desert road. That would be fun. Fanny finding a secluded spot for a “rest break”. The road was actually OK, with a few sections of gravel and sand where it was under repair. There were very few vehicles on the road that continued right across to the desert to Eilat in Israel at the border with Aqaba in Jordan. The riding was absolutely glorious and we watched as the sky put on a display very few people ever see, unless of course they are in the middle of a desert as the sun goes down. Blue, violet, green, turquoise, purple, yellow, pink, purple, black. Quite stunning and surreal. 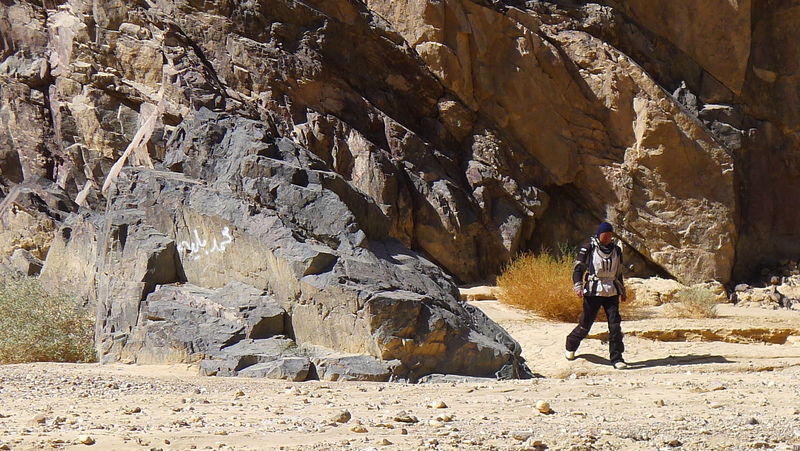 I saw a great place to camp in a wadi about a kilometer off the road, and importantly saw a track to get there. I did not want us to be observed riding off the road and told Fanny that we should ‘get the cluck on with it’ when the time was right and get out of sight. Fanny was not comfortable riding on the gravel and down the embankment through sand and so I rode my bike first, parked it near to a suitable secluded camping spot and then hiked back to the main road to get Fanny’s bike. As I climbed back up the wadi embankment to get Fanny’s bike I saw a pick-up on the main road bridge stop, reverse and disappear backwards. Not good. No more than three minutes later a white pick-up truck suddenly appeared above the wadi and five men, all wearing Yasser Arafat gear looked at us and entered into a discussion among themselves. Again I felt uneasy about this, my defence instincts were heightened and I felt particularly uncomfortable about the whole situation. They never bothered to engage us in any conversation and then they drove off. Fanny was tired and wanted to rest and set up camp. It had been a long day, but I broke the bad news that we should go. Paranoia? Perhaps, but it did not feel right. Again I worried that we may have a middle of the night visit and I wasn’t going to spend all night on guard duty brandishing my Masai warriors sword waiting for whatever. 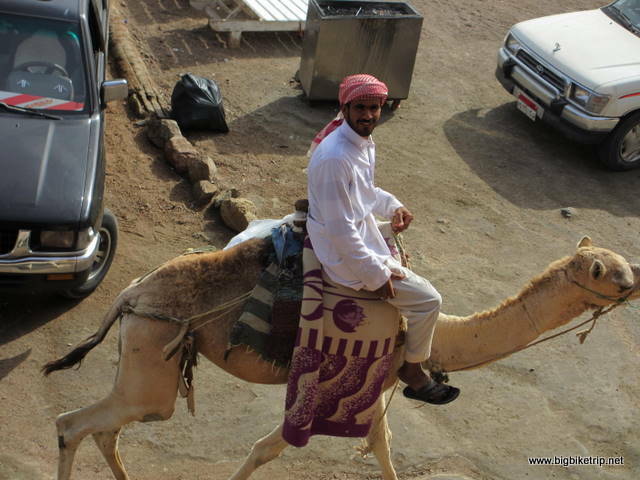 If I had been on my own I would have ridden much further into the desert, found a secluded spot and been quite at ease. In this situation I had a responsibility towards Fanny and to err on the side of caution was the right thing to do. As we rode off the sand track and back onto the road, I looked back and was fairly disappointed that the human risk element had prevented us enjoying a camp fire in the middle of the desert under the stars. 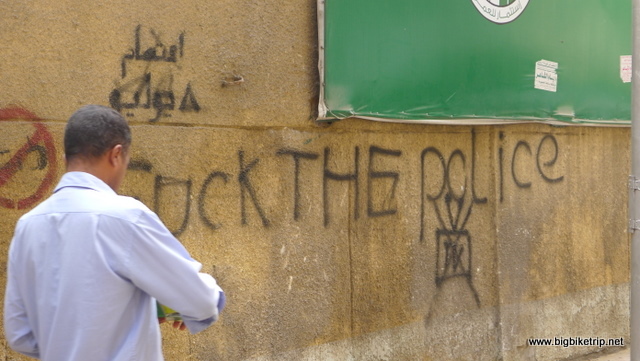 In Sudan it would have been no problem, in semi anarchic Egypt not so sure. The sky was now quite dark, but after thirty kilometers I spotted another potential bush camping site and rode off the road down a sand bank and then beckoned towards Fanny to follow. After some hesitation she did, and as she descended the sand bank I clearly saw her touch the front brake with the expected result that the front wheel washed out and she dropped the bike on the slope. Damn. I knew that was the last chance. Fanny is very capable of handling the bike on most surfaces, she has proved such on the expedition, but along her biking evolutionary scale she had reached the level many very experienced riders reach and often stay at… a complete fear of sand. To move on she will need to do some off road courses with Leon and team at Country Trax in South Africa or perhaps the UK Yamaha adventure riding team in Wales to get her over this hurdle and then she’ll be fine. Earlier on our trip in Kenya, we met two BMW riders from England, Russ a thoroughly nice guy and all round gentleman and his bullying and arrogant companion, Darren, a thoroughly selfish and unpleasant individual who reminded me of a colleague I endured at Arthur Andersen a decade ago who was a weekend warrior and a bit of a “merchant banker”. 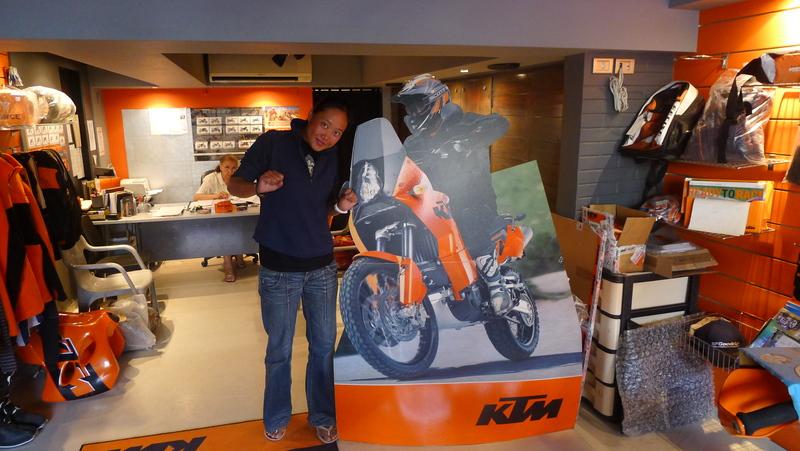 Darren commented that Fanny could not handle the large and powerful KTM 990 Adventure and was critical of me for allowing her to do so. He was even more critical of me for my robust and none compromising encouragement when she occasionally eefed it up. Little did he know that Fanny is made of much sterner stuff and can handle her Mad Max riding companion perfectly well, the KTM and still have time for noodles and tea. Fanny is one of the strongest and toughest people I have ever met and dumbing down to an F650GS is not in her nature. She insisted on the KTM as it is clearly the best adventure bike there is and has an enviable reputation throughout China because of its Dakar heritage. I am quite sure a week or so throwing a smaller KTM, CF Moto 700 Adventure or a Yamaha enduro around some sand dunes, through woods and up and down the hills in South Africa or Wales with a good instructor will set her up for anything. She has the attitude, determination and strength and the skills can follow in good time. I also accept I am not the person to instruct her. Anyone who has tried to teach their wife to drive will know full well its a futile exercise, especially if you have the instruction style of the drill pig in “Full Metal Jacket”. Anyway, back to the Sinai desert and a KTM on its side and nose pointing down a sand embankment. 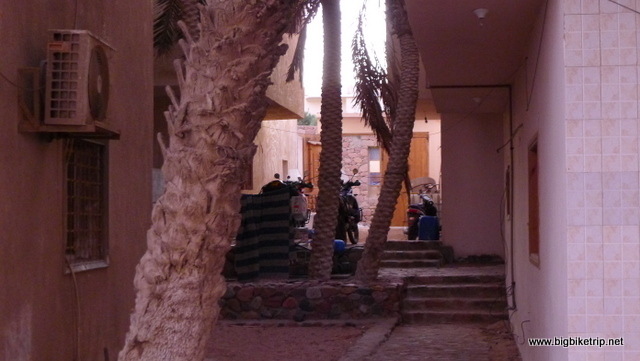 With some effort, but by now quite well practiced, Fanny and I hauled her bike back up the sandy slope and we had no option but to carry on to the next town, some hundred kilometers away, or push on towards Taba and Eilat in Israel, or even through the desert roads south east to Nuweiba . The sky was now pitch black and filled with tens of thousands of stars. In South Africa I was used to seeing the southern hemisphere sky filled with stars above my house, but I was unfamiliar with constellations of the northern hemisphere sky. In England, Europe, China, and Hong Kong where I have spent most of my life there is too much ambient light and air pollution to really see the stars clearly. 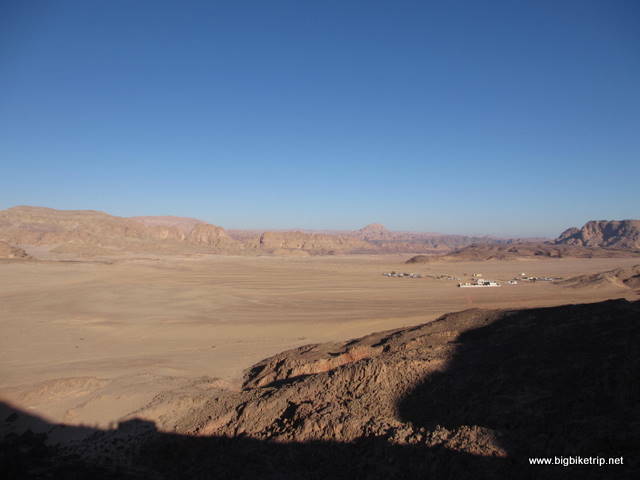 Here in the heart of the Sinai desert it was absolutely spectacular. We pulled the protectors off our headlights as the orange glow ahead was just a bit too… well… orange. There was not too much on coming traffic, but the few there were could be seen for many miles ahead and as they passed us they rarely dipped their headlights which was a tad annoying and uncomfortable in the pitch darkness. Actually, we rarely rode at night on the Big Bike Trip as its considered a big “no no” in adventure riding, but we were in middle of desert on a good road, and despite not being able to see much we had to admit we loved every minute. 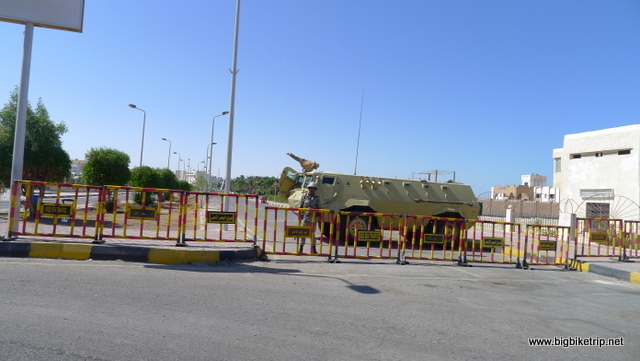 We eventually arrived in a dimly lit small town called Nakhl right in the middle of the Sinai which was full of soldiers and tanks. I have done some boring jobs during my early police force career, but sitting on a tank in peace time in the middle of the desert struck me as particularly dull by any standards. They all seemed quite friendly though, and very interested in our bikes and Fanny whose name we learned is popular in that part of the world. They told us there had been very recent skirmishes with Bedouins who had been robbing travelers and raiding Egyptian properties. Apparently, these itinerant desert dwellers felt that in the new post Mubarek era they had remained excluded and dis-empowered and were not happy. Everyone seemed to agree we had been lucky not to get robbed, although I thought this is was perhaps an over exaggeration or a ploy to frighten off travelers. That said, I looked back to our experience a few hours earlier in the desert and the non too friendly Beduoins who pitched up and I thought we made the right decision not to camp in the desert on this occasion. We stayed in the only hotel in town, despite many people telling us there wasn’t one. It was a truly awful place and basically a construction site, but we got something to eat and a place to park our bike in the corridor right next to our dreadful room where we set up camp with our much used and treasured mosquito net. Where mosquitoes come from in a dry desert I can only guess, but they are persistent little buggers and can ruin a nights rest. 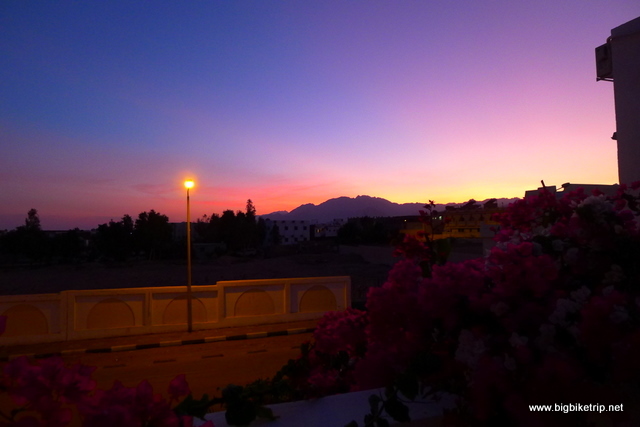 We did not hang about the next day and got up very early and rode to Nuweiba through amazing mountain passes, deserts and palm tree lined oasis. 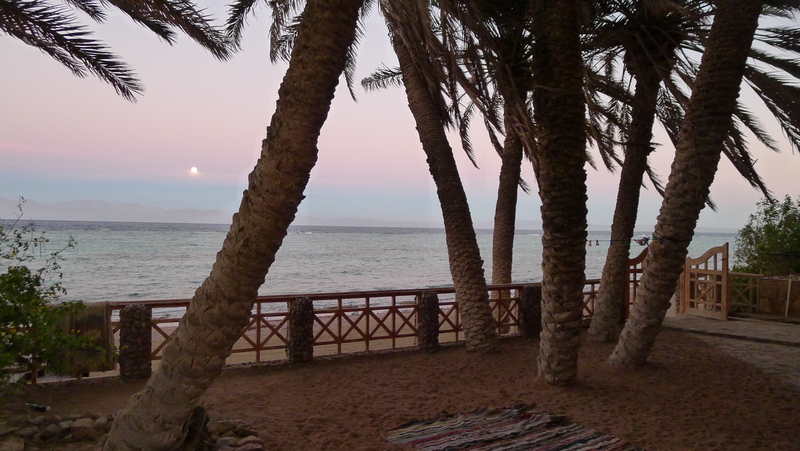 Relaxing evenings after windsurfing or snorkeling. 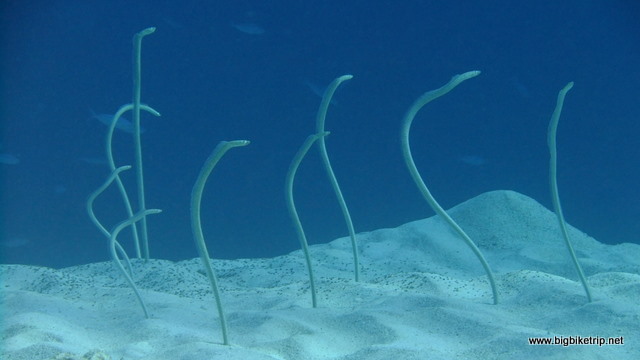 I could snorkel for hours and often did.. immersed in a parallel universe of strange and beautiful creatures. I later learnt to scuba dive, but I far preferred the peace and unencumbered freedom of snorkeling. 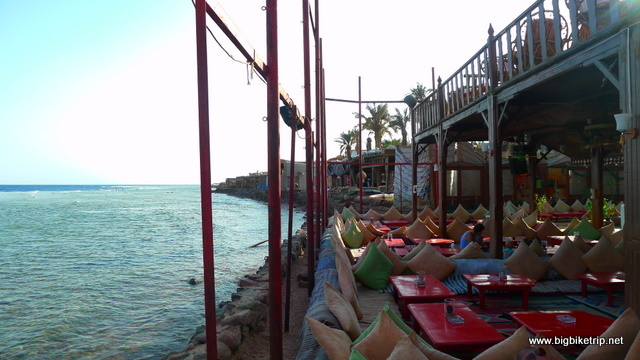 And the Red Sea is one of best places to do it. 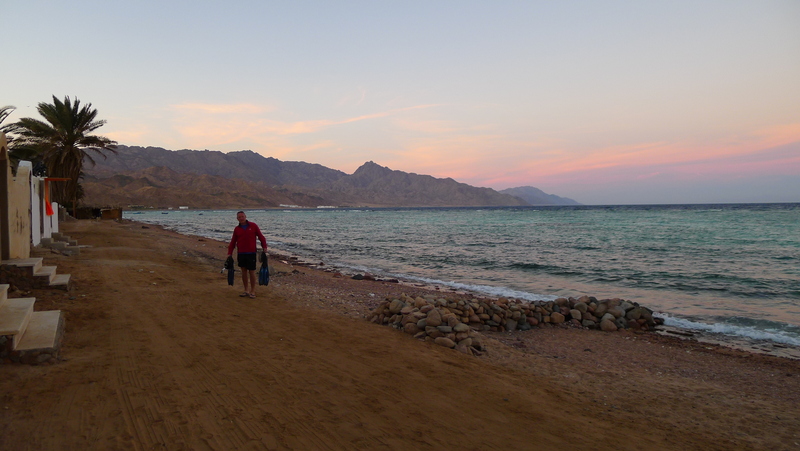 We then descended out of the mountains into Nuweiba where the ferry departs to Aqaba in Jordan. 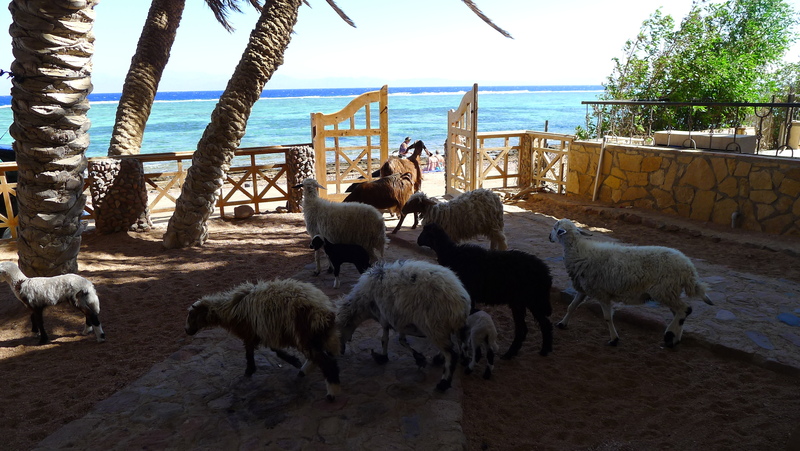 After a spot of lunch/breakfast at a rather deserted, but pleasant beach resort we then turned south and back into the mountains and coastal passes towards Dahab. We then started looking for an apartment to rent and, like house hunting, we saw some great places that were out of our budget and thoroughly nasty places that were in it. 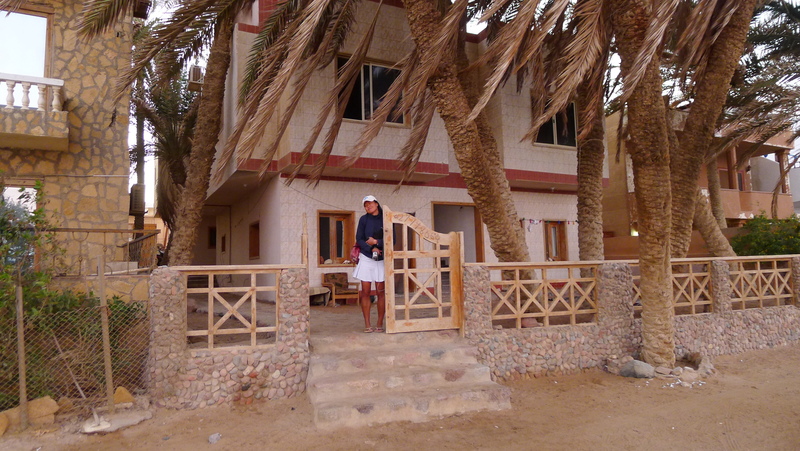 Eventually we found a small one bedroomed apartment right next to the sea. It wasn’t great, but the landlord told us it had TV, internet, fresh water and a kitchen. The selling feature was the garden which was essentially a private little beach with four massive date palm trees that swayed in the sea breeze. Mohammed, the landlords son who dealt with us, was either a complete idiot, or thoroughly untrustworthy, I suspected both. He looked 45 but was actually 22 and his attire would swap between orthodox Islamic white robe with matching red Yasser Arafat headgear to the laughable clothes that lead actors in Bollywood movies wear with slicked back bouffant hair, tight jeans, garish shirt opened to his navel… ooh and a few gold medallions. Its not a great look. At Mohammed’s insistence we handed over the cash (including water surcharge) and later found out there was no internet, the water supply was in fact sea water and the TV gave whoever changed the channel an electric shock. Fanny and I would endure the many local channels that showed real time images of pilgrims walking round and around the big cube at Mecca for hours and hours until we managed to suss out how to change channels with an insulated stick as we never ever found the remote control and we got fed up repeatedly asking our landlords idiot son to give us one. 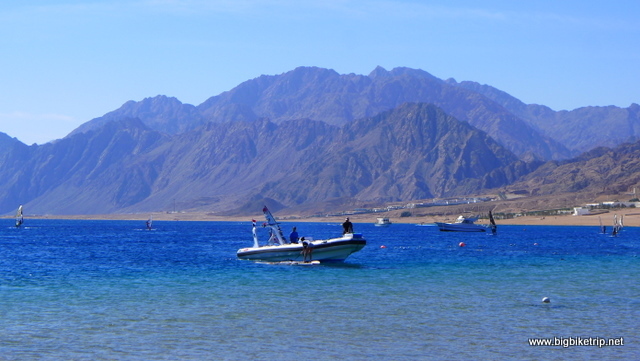 But all these things were minor as we were living next to the stunning Red Sea with the majestic Sinai desert mountains behind us. Not too shabby at all. Our apartment.. nothing worked in it and it was a health and safety nightmare .. but it was right next to the sea and the views were amazing. Fanny has found herself a furry friend.. or is it sweet and sour goat night? We don’t know where your kid went … honest. 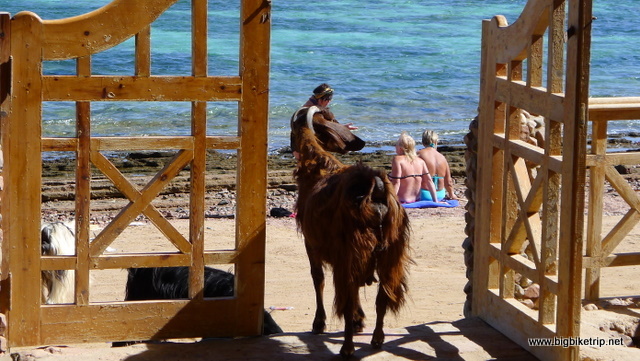 Our neighbours were either local Bedouins, beach bum kite surfers, serious scuba divers or hippies with loads of kids. Not those cool 1960s type hippies with colourful tie dye clothing and affros, but the 2010s grungy types with ugly cloths and grumpy disapproving faces full of studs and tattoos. These hippies all looked the same to me because in their attempts to non conform they all conformed to the same uniform you see worn by hippies the world over. 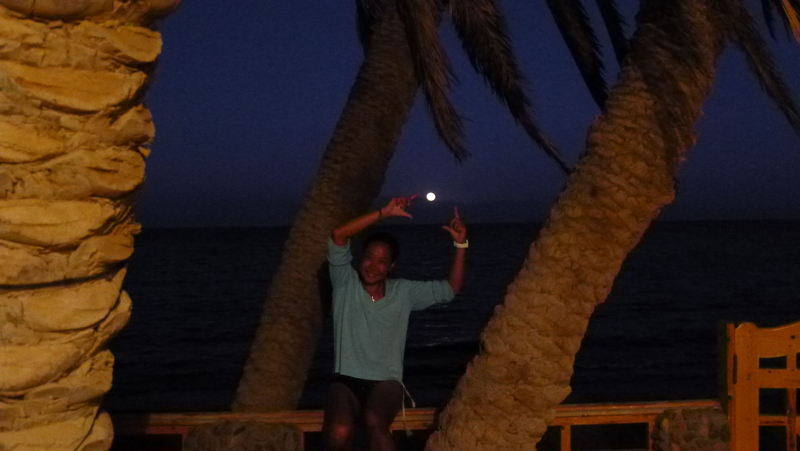 At least Fanny was not the only person in Dahab wearing “effnic” MC Hammer trousers with a crotch below the knees. They were the only ones in KTM orange though. And with this harmonious neighbourly relations were firmly established. Actually, I finished panel beating pretty soon after, just as afternoon calls for prayers from our local mosque had started. ‘HAAAAWWWWAAAAAHHHH AKBAAAAR’ —-The panniers now looked as good as new and the next door baby started crying. 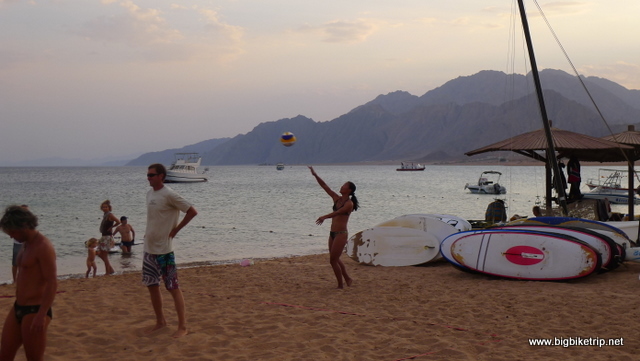 Fanny giving the Russians a lesson in how to play beach volleyball. Both Fanny and I took kite surfing lessons for a few days in the lagoon, an ideal location, but we soon gave up. I hate giving up, but Fanny was having trouble controlling the kite and I spent the whole time being yanked under water inhaling plankton. Whilst I could handle the kite easily enough, years of paragliding I guess, I could not stand up on the wake-board how ever much I tried and I was running out of money and my instructor was running out of patience. I even tried wake boarding behind a boat to try and hone some skills and even that instructor gave up on me. 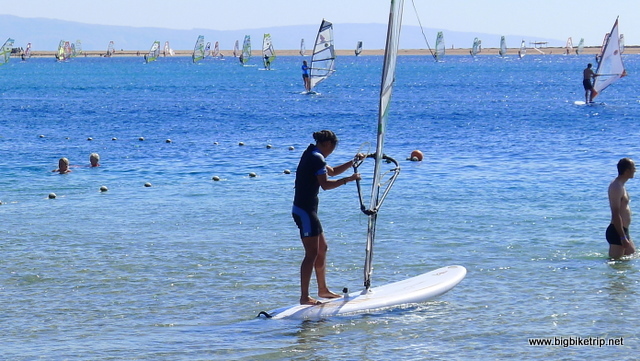 So we decided on windsurfing lessons for Fanny and free diving practice for me. 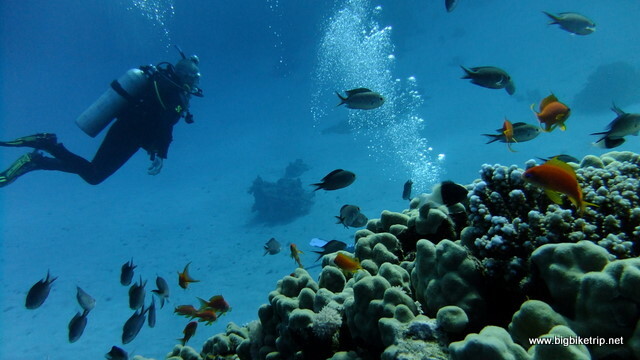 Despite the perfect location, I had little interest in scuba diving and even less bobbing around underwater with all that restrictive diving clobber and so I invested in free diving fins and a mask. Both of us became quite good at our new hobbies. Our days of idleness were interspersed with researching how we would proceed further on the Big Bike Trip –applying for visas and permits, planning routes, and getting the bikes back to pristine condition. Fanny perfected her sleeping expertise and got better and better at wind surfing and the rest of the time impressed all with her beach volleyball skills. I went running everyday to get back into shape, practiced Mandarin with Fanny and studied my Chinese lessons. Occasionally, I would run up into the mountains whilst studying Chinese being careful not to fall into one of the many gullies and have to cut off my hand to escape. The rest of the time I went snorkeling and free diving right outside our house. Free diving was introduced to me by Alexey Molchanov, a Russian and world champion who was training at the nearby famous “Blue Hole” that goes down to a depth of over a 120 meters. His mother is the women’s world record holder and I have actually seen her featured on the Discovery Channel a few times diving to incredible depths wearing a huge mono fin. Its an amazing and rather scary sport and requires more skill than you would think. Alexey can hold his breathe for 8 minutes, 31 seconds in a zero exertion submersion situation. He can also swim ten laps of a 25 meter pool underwater. My pathetic efforts improved somewhat and I was getting down to about 15 meters and holding my breathe for about a minute and a half. 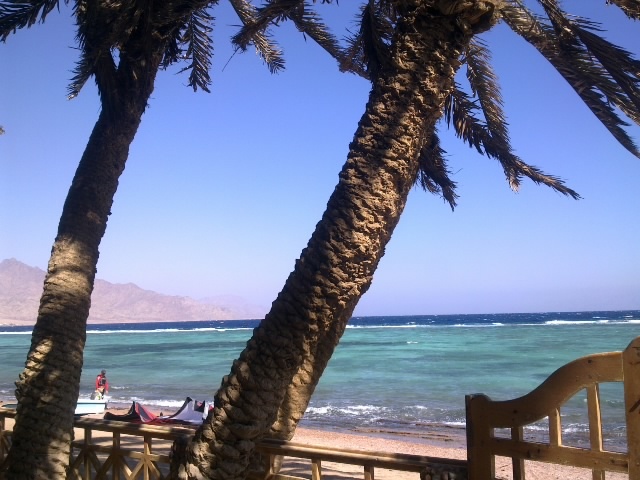 Not that impressive, but my main objective was to be able to go snorkeling and hold my breathe long enough to enjoy the amazing coral reefs and swim with the incredibly colourful and varied marine life of the Red Sea. 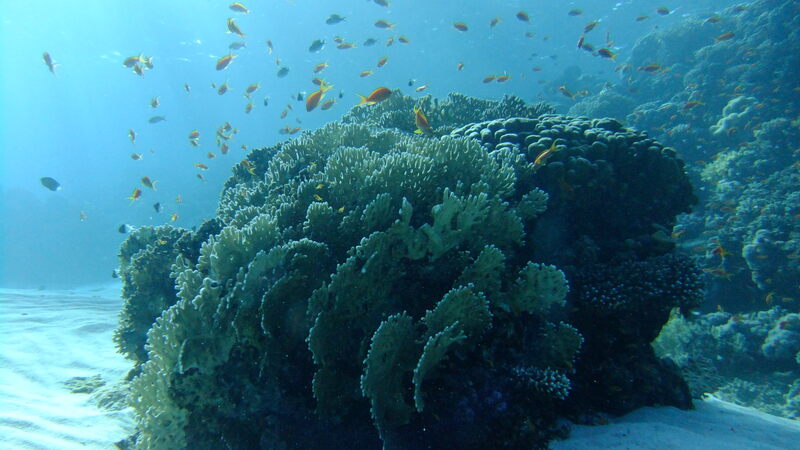 Beautiful marine life and coral reefs along the entire coast. 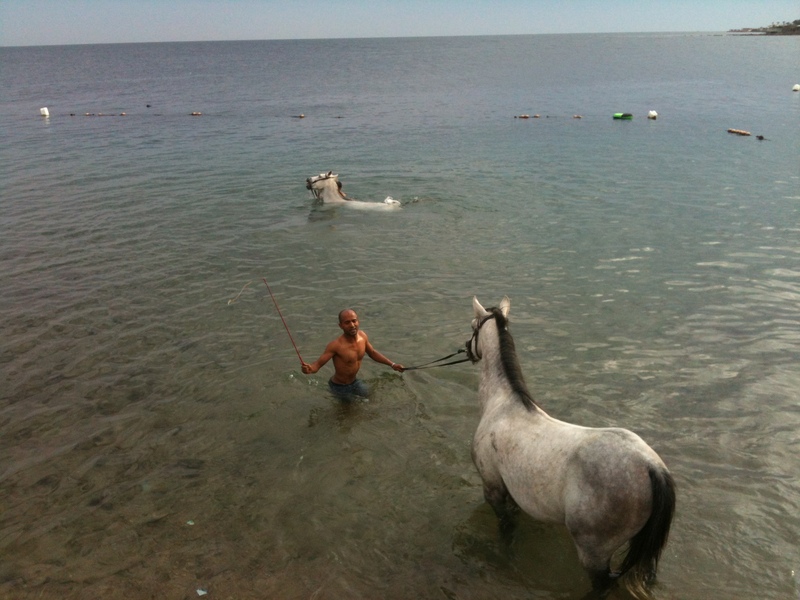 Taking the horses for a cool down. Not sure what salt water does to a horses skin, but they seemed to like it. Got to find something to do in the evening as the TV electrocuted us each time we touched it. 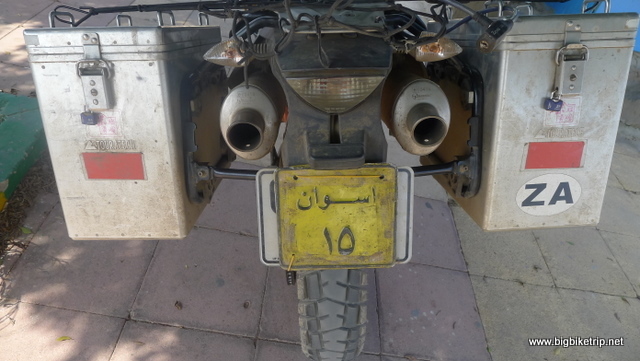 This entry was posted in Africa, KTM, Route, Uncategorized. Tagged 990 Adventure, Africa, Al Harghada, Alexandria, Aswan, Bedouin, Cairo, camel, corruption, Dahab, Egypt, Egyptian Museum, falafel, ferry, ful, kite surfing, KTM, KTM Egypt, Libya, Luxor, Mohammed, Moses, mosque, motorcycles, Mount Sinai, Mubarak, Nile, Nubian desert, Padi diving, Peugeot, Pharaoh, Pirelli, Port said, Red Sea, Riots, Sahara, scuba diving, Sharm El Sheihk, Sharm El Sheikh, Sinai, snorkeling, St Catherines, Syria, Tahrir Square, tea, Ten Commandments, Valley of the Kings, voleyball, Wadi Halfa. It’s rude not to share! Particularly since I am living in Miami, a town filled to the brim with corruption. I really didn’t like where this post was going. At one point I really thought you were about to get knifed, at the very least. Glad you ended with photos showing you in a serene and beautiful environment enjoying yourselves. Seems reasonable to me …. Like Fanny, my girlfriend Andrea drops or crashes the bike … stands up and drive on ! Tough girls !